Electro Magnetic Lock is suited for Interior Doors, Perimeter Exit Doors and Entrances that require Fail Safe Emergency Release Capability, and meets both security and fire safety requirements for emergency exit doors. Suitable for double leaf metal and wooden doors. 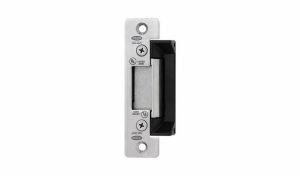 Electro Magnetic Lock is suited for Interior Doors, Perimeter Exit Doors and Entrances that require Fail Safe Emergency Release Capability, and meets both security and fire safety requirements for emergency exit doors. The Electro Magnetic Lock is a simple locking device consisting of an electromagnet and armature plate which works purely on the magnetic field, without moving parts, making it fail safe. The Electromagnetic Lock uses an electrical current to produce a magnetic force which securely bonds the energized electromagnet against the armature plate. The Electromagnetic lock is operated by a peripheral device, such as a fingerprint or card reader or keypad. The user is identified and if access is permitted, the power to the lock is automatically turned off and the door is able to open. Suitable for double leaf metal and wooden doors.